The Gray Report: Are wines made by women different? 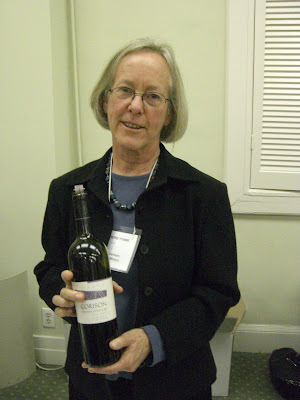 That was the title of an event I more or less crashed last week, because Brigitte Rulier-Loussert, proprietor/winemaker of Chateau Dalem -- who makes, IMHO, the best wines I've tasted from Fronsac -- told me about it. Are her wines "feminine"? Only if you consider ripe fruit and rich tannins "feminine." Not only are Brigitte's wines good, they're also on the New World side of the equation (which, considering the fierce tannins in old-style Fronsac, is not a bad thing.) I don't think they're overdone; not at all. But tasting them, I don't think I would guess a woman made them. It's a popular media myth that women make more well-balanced, food-friendly wines than men. I can debunk that with two words: "Helen Turley." I also think fine winemakers of full-bodied wines -- like Heidi Peterson Barrett and Carol Shelton -- would be a little insulted if you told them they made "women's wines." However, that doesn't mean there's not a place for this event, and it's because of something Brigitte said to me. Looking around the room at a dozen female American winemakers, another dozen female winery proprietors and a bunch of sales reps (many were daughters of women winery owners or winemakers), Brigitte said, "We don't have this in France. There I am unusual. To see this many women who make wine together, it is a great thing." I looked for some unifying theme to the event, other than the gender of the people behind the table, but didn't find one. Some white wines were crisp and refreshing; others were blowsy and overoaked. I tasted some beautifully elegant red wines (most are listed below) and some clumsy ones, and some that were so tannic they were almost painful. Then I went straight to my dentist's office, where I expected to get chastised for coming in with gums full of Sauternes. Unexpectedly, she didn't mind; I guess my breath was sweeter than usual. did a post on this one as well. Interested in your thoughts on the Haskell's. Is this point of difference that you perceive stylistically an angle that can work in the U.S. market for SA wines, or is it a bridge too far at the moment? Hi Grant, I personally think the Haskell Syrahs will find more appreciative audiences in other countries. Syrah is already a hard sell here and these, while genuine expressions of the grape, don't have the taste profile Americans seem to prefer when spending $40 and up for a wine. One can rant against Parker, but I think he's successful because he knows what wines big-spending Americans like.